I have been wanting to write a review of Created To Be His Help Meet for a long time and while working on an article on this topic for another publication, remembered my response to a woman named Joy who left a comment here a year or so ago. Since it pretty much sums up my concerns with Debi Pearl’s writings, I thought I would post it in my book review section. Hi Joy, and thanks for being willing to continue this dialogue. It is so much more refreshing than drive-by commenters who only want to blast away and never come to any sort of understanding of what I am saying or to help me understand another position. I appreciate your thoughtful and gracious response. I would wholeheartedly agree that one of Debi Pearl’s motivations for writing Created to Be His Help Meet is to encourage women and to help them have what she calls a “heavenly marriage.” I believe that her intentions are good ones and that she actually believes that the suggestions she makes in her writings are “Biblical” and will produce good fruit. However, truly good fruit is the result of godly wisdom (James 3:17) and the work of the Holy Spirit (Galatians 5: 22-23), not a man-made or woman-made paradigm. The problem is that Debi Pearl has taken some concepts that are true and good, has combined them with some silly notions of her own, and has made them the cornerstone of what she believes it takes to have a “heavenly” marriage, creating a paradigm for women to follow. And the most dangerous aspect of it is that she has sprinkled it all with Scripture and pronounced it “biblical” so her readers believe that it is found in Scripture and if not followed, will cause them to sin. In fact, Debi Pearl herself claims that it is THE WAY to have a “heavenly” marriage. She has made believing and following her pattern in her own marriage the standard for all marriages when Scripture makes no such distinction. Let’s look at just the areas you mentioned. First, you mentioned the “wisdom of her years.” I agree that there is value in gleaning insights from women who have been married many years and who are enjoying the fruits of having children and grandchildren. As you read through my blog, you can see that I have a high regard for older women, both ones I know in real life, those I have met online, and women I have met on the pages of their biographies and books. 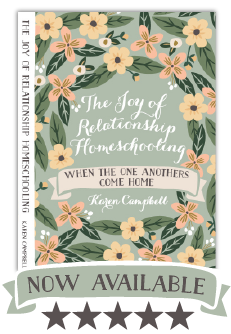 You will also see that I take very seriously the season of life I am now enjoying as an older woman and the purpose of this blog is to encourage homeschooling moms (and anyone else who comes this direction) by pointing them to Christ and to the Word of God as our standard. I hope no one ever takes away any promotion of a paradigm to follow when they read here! I can probably list several dozen older women I know who have enjoyed and still enjoy “heavenly” marriages but whose relationships look nothing whatsoever like the one Debi and Mike Pearl have. Most of them are in Christian marriages, have a high regard for the Word of God, and are enjoying children and grandchildren who also love the Lord. I also know many unbelieving couples who have been married for decades who wouldn’t understand the first thing about Debi Pearl’s perspective on marriage who have still enjoyed a wonderful relationship and continue to do so. 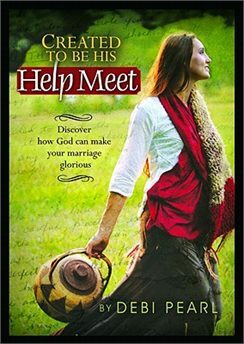 There is no special formula for achieving a “heavenly” marriage and to advertise a book that says that there is, is the first problem I have with Created to Be His Helpmeet. The standard for truth is not in what Debi Pearl describes as a “heavenly marriage” but rather,what the Scripture actually teaches about relationships that are honoring to God. Debi Pearl has placed a wife’s submission to her husband as central to having a godly Christian marriage and I agree that submission is important. But what troubles me is how that concept is being interpreted by the Pearls and how it is not taught in context as one of the many one anothers of Scripture. A man and a woman in a Christian marriage are, first and foremost, brothers and sisters in Christ. All of the one anothers are commands that apply to them…to admonish one another, serve one another, submit to one another, love one another, forgive one another, exhort one another, etc. These actual commands of the Word of God are abysmally missing from Created to Be His Help Meet. In fact, her misunderstanding of the word “help meet” is at the core of the problem with this book. In Hebrew the word is “ezer” which is often used in Scripture to describe God as our ezer. It is a military term that, when applied properly, demonstrates how women are to be engaged in spiritual battle alongside of men. And there are other ways that Scripture is either taken out of context, ignored, or completely absent. Debi Pearl’s examples of the three types of men, for example, cannot be supported anywhere in Scripture and by placing a husband into one of Debi’s categories, it can prevent a woman from obeying the commands “to admonish” or “to exhort” or to expect a husband, a brother in Christ, “to serve” or “to submit.” Imagine if I wrote a book that placed just one command, like “to admonish” at the center of the whole relationship, how out of balance and destructive that relationship would be! And as far as Debi’s list of admonitions to women as you noted on page 254 of her book, I do not believe these are all commands for all women. Do you agree, for example, that all women are to have long hair and to have their heads covered when praying? When it says women are to keep silent in the churches, how is that interpreted? Can women sing in church? Testify in church? Her admonition for women to be keepers at home has been interpreted by many that women are never to have a job outside the home, no matter what the circumstances might be. Other godly Bible believing Christians disagree. My friend, Sue, for example, who has been married for years to a disabled husband who was a former pastor, teaches school and has to in order to keep a roof over their heads. They have a heavenly marriage. Are they sinning? According to Debi Pearl’s list, she is dishonoring God and is to repent of this in order to have a heavenly marriage. Also, there are examples of women throughout Scripture who made a living of their own, such as the women who accompanied Jesus and the disciples in order to financially provide for them and Lydia, the wealthy seller of purple who ministered alongside Paul. We do not know if any of these women worked from home or were in the business world. We also don’t know if they were married or had ever been married and if their marriages were heavenly or not. Many things on her list that she sees as requirements, again, are taken out of context of Scripture and placed into a paradigm Debi has created for godly womanhood and heavenly marriage. Joy, I understand that, from Debi’s perspective and within her paradigm, she believes that following what she has written will lead to a heavenly marriage. But the truth is that following her pattern is, first of all, not required for all women and secondly has lead to the spiritual and emotional death of many women. I am not saying that all families will fall into this situation because I believe there are husbands and wives who genuinely are contented with following the Pearl pattern and believe they are living the only way one can live and have heavenly marriages. But I do know that forcing women into a man-made paradigm by telling her she is sinning if she doesn’t obey it is spiritual abuse that often leads to spiritual death. One more thing to note: Debi Pearl is not the only writer who does this, by a long shot. Read my review of Passionate Housewives Desperate for God by Jennie Chancey and Stacy McDonald or listen to the discussion I had with Spunky on the Botkin Sisters’ book So Much More in the patriocentricity podcasts for more examples of paradigm peddling.